With respect to effort, there are only two ways to work: with or without ambition. Those who happily work without ambition are just ambitious enough to get a job and to keep it, despite whatever scorn, teasing, pity or ridicule they face for their contentment. Those who work unhappily without ambition are, in general and unfortunately, those who have lost hope. Obviously, jobs without opportunity or pressure for “advancement” are the ones in which ambition is unnecessary or pointless, e.g., many basic and routine service or manufacturing jobs. However, a lack of ambition can also thrive in elite positions that, once achieved, allow for what others would call “stagnation”, e.g., the comfortable routine of a capable and content family doctor in a sleepy small town that echoes his indifference to city and career hustle. For him, life is a pond to enjoyably skate on, not a ladder to climb. In more technical terms, the doc and the happy grill-man at a diner define success and satisfaction as “homeostasis”—maintaining an optimal “horizontal” equilibrium, rather than seeking a new, “higher” one as another rung climbed, with ever-changing optimal equilibria on a “heterostatic” vertical career ladder. In the view of working skaters like them, who like things just as they are, perpetual or vaunting ambition makes about as much sense as ambition to inhale and exhale better tomorrow than today, when one’s breathing is already as good as it gets or needs to be, much like the perfect body temperature of 98.6 F that requires no change or “advancement”. In their take on things, success is like beholding the splendor of a perfect sunset: No improvement on it will be necessary, possible or desirable. Critics of these happy skaters will, of course, be tempted to define or otherwise characterize their “lack of ambition” pejoratively—as “laziness”, “drift”, “unimaginativeness”, “stagnation”, “purposelessness”, “lack of faith in oneself“, “timidity”, “settling for less”, “[fear of] failure”, “being a loser”, “selfishness”, etc. Indeed, calling it “lack of ambition” stacks the deck and begs the question, unlike “no need of ambition”, which is less pejorative. But what the ladder climbers cannot claim is that, among the happy skaters, a lack of ambition is “unsatisfying”. No, the most they can hope to claim, but have difficulty proving, is that the happy skaters could be happier, if only they tried as hard as the ladder climbers. But, again, could or would the skaters necessarily be happier or more successful if they had more ambition? Possibly. One way they could be wrong in choosing to skate rather than to climb would be if they are wrong about what is optimal for them—which, from their perspective, would be like being wrong about their optimal body temperature and what is “natural” for them. Another way a happy skater might fail to see any point to or real merits of ambition is if [s]he gets the cost-benefit analysis wrong—including all associated opportunity costs, costs and benefits of the extra efforts required to “advance”, and the costs of finding and maintaining a position on a “higher rung”. But that will be a pointless pitch when the “homeostasist” skater interprets ambition as the effort to improve on 98.6F—to which costs and benefits of further effort to improve upon it are pointless and impossible, respectively. What about the happy ladder-climbers? Things are a bit more complicated for them, because complete contentment and happiness on the way up to another rung or at a rung are much less likely than for a skater. This is because ambition is so often marked by discontentment—as a pressing desire to escape what is, for what can be, for change and becoming, even perhaps just for the sake of change. In contrast, the skater is content with a core state of being, spiced up now and then with dashes of becoming and change, served up sparingly, yet delightfully. However, the climbers don’t have to suffer the fate predicted for them by an enlightened Buddha preaching the folly and illusion of all striving and worldly ambition. In the first place, a smart climber will enjoy not only the climb to the next step, but also being there—at least for a while or a pause, before the next step, not with impatience, but with pleasurable anticipation. The trick to meeting the climber challenge is, of course, to enjoy each rung as much as contemplation and achievement of the next one, and to be able to look down the ladder with as much pleasure as in looking up. That’s the cliché— “The journey matters as much as the destination” [and variations on it]. What this means is that a climb up a career ladder should not only blend times of being on a rung with times of change of rung, but also seamlessly and pleasurably integrate the former with the latter on the ascent. But what must not be forgotten is that in each skater there has to be a climber and in each climber there should be a skater content with whatever time is spent on each rung. To even lace up and get on the ice, a modicum of ambition is required—but not much. Although, in self-defense, a skater might try to argue that he does have a future-oriented ambition and that his ambition is to keep things as they are, that explanation dilutes the concept of “ambition” to the point of uselessness, even if it does capture the element of self-motivation and incentives is shares with pure ladder-climbing advancement-defined ambition. 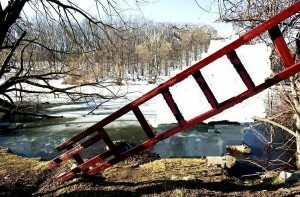 Of course, just as the happy ladder-climber may disparage the happy skater with pejorative labels, the skater is quite happy to reciprocate and characterize “ambition”—especially insatiable ambition—as “needless”, “compulsive”, “greedy”, “obsessive”, “stressful”, “workaholic”, “chronic discontent”, “self-defeating”, “over-compensation”, “monomaniacal”, “not living in the moment”, etc. is finite, e.g., to become CEO and only a CEO. Such a happy finite-ladder climber is actually a skater-in-the-making, differing from the average happy skater only in the quest for a pond at a higher elevation. Having achieved his primary goal, he is ready to, using a well-known trope of Austrian philosopher Ludwig Wittgenstein, “climb the ladder, and then kick it away”. makes the journey and its pauses as satisfying as Mozart’s composing a concerto, when the next step to take, like the next note to write, is as pleasurable as it is necessary, and maybe even more so than the one before. Just as there are skaters of circumstance rather than choice–i.e., dead-end-job skaters without hope or opportunity, there are also climbers forced, willy-nilly, to scramble up some rank or performance ladder, e.g., “publish-or-perish” professors or workers burdened with ever-increasing production quotas. …get a kick out of climbing it.